Kīlauea volcano, on the Big Island of Hawaii, typically has effusive eruptions, where magma flows to create ropy pāhoehoe lava. But Kīlauea sometimes erupts more violently, showering scoria and blocks over much of the surface of the island. To explain the variability in Kīlauea’s eruption styles, a research team analyzed 25 eruptions that have taken place over the past 600 years. 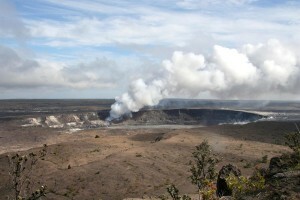 The team included Bruce Houghton, the Gordon Macdonald Professor of Volcanology in Geology and Geophysics at the University of Hawaii at Mānoa School of Ocean and Earth Science and Technology (SOEST), colleagues from the University of Cambridge, and Don Swanson from the Hawaiian Volcano Observatory of the U.S. Geological Survey. Their research shows that the ultimate fate of a magma at Kīlauea — that is if the eruption will be effusive or explosive — is strongly influenced by the variability in composition of the deep magma. 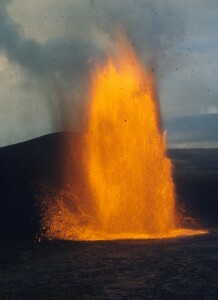 In short, more gas-rich magmas produces more explosive eruptions. “Gas-rich magmas are ‘predisposed’ to rise quickly through the Earth’s mantle and crust and erupt powerfully,” Houghton explained. One of the biggest challenges in volcanic forecasting is to predict at an early stage the full path that an eruption will follow. Monitoring gives scientists an indication where an eruption will occur but not always the probable form it will take. This investigation, published this week in Nature Geoscience, required careful analysis of the physical and chemical properties of eruption products over the last 600 years. Swanson and Houghton supplied a framework of very well-characterized eruptions using a detailed classified scheme for the size and power of the eruptions. UC performed nano-scale measurements of the original gas content of the magmas as ‘frozen’ in tiny packets of chilled melt inside large crystals in the magma. This new look at the eruption history at Kīlauea has led to new understanding of what causes eruption style there. “Pre-existing wisdom had it that the form of an eruption was principally decided during the last kilometer of rise towards the surface. But now we know the content of dissolved gas at the deep source is a key,” said Houghton. In the future, Houghton and colleagues hope to offer even more accurate models by estimating just how fast magma does rise at Kīlauea prior to eruption by using the rates at which the trapped original gasses can ‘leak’ out of the trapped magma. From Marcie Grabowski, University of Hawaii at Manoa. Lava fountain photo credit Hawaiian Volcano Observatory, U.S. Geological Survey. Crater photo credit Christine Heliker, Hawaiian Volcano Observatory, U.S. Geological Survey.